Digitizing the navigational publications of its entire fleet is not just a matter of convenience for Elcano Brazil. The move is part of a strategy towards minimizing the company’s impact on the environment and achieving ISO14001 accreditation. Taking the lead from its Madrid-based parent company, Empresa Naviera Elcano, which was awarded ISO14001 in 2017, Elcano Brazil has had its sights set on this goal for some time. “We are using NaviTab to increase the efficiency of our operations and reduce the risk of non-compliance, but perhaps even more importantly, we are aware of our responsibility toward the environment,” he says. NaviTab also has an optimized search engine that automatically locates the latest available publications and licenses. 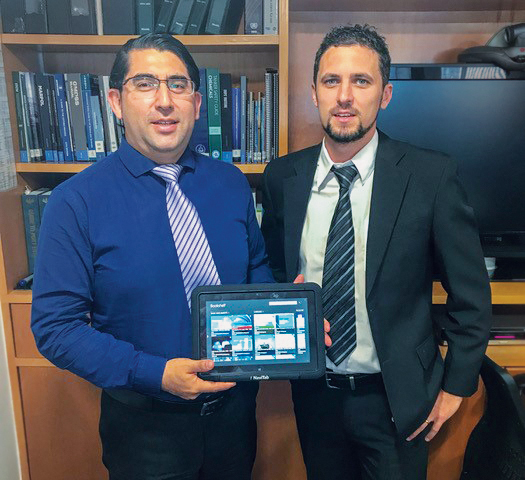 As a virtual library for continuously updated maritime publications, logbooks and documents, the tablet saves vessels an average of 30% per year on publication purchase costs. A vessel has on average 102 paper books onboard which, if piled up, would reach up to six meters tall. Digitization of these publications reduces the environmental impact of every vessel. Replacing heavy books and documents with a lightweight tablet also saves on freight fees. Elcano Brazil has also installed Neptune, StormGeo’s solution for updating charts and publications, onto its entire fleet. Combining this with the addition of NaviTab enables the digitization of the company’s fleet. Elcano is not the only South American shipping company to realize the environmental benefits of digitization, says StormGeo Brazil’s South American representative Cristhian Marshall. “We have noticed more and more shipping companies taking the initiative to become fully digital in the past year. Our knowledge and technology contribute greatly to this cause—bringing solutions necessary for digitalization to this market. As such, we are looking forward to some exciting partnerships in this region,” he says. “NaviTab can help with some of the uniquely South American challenges that shipping companies face in this region,” adds Marshall. This includes long delays at customs due to crew not being up to date with rapidly changing regulations between countries. This puts companies at risk of fines and other serious penalties for not having the correct information on board. “As this is a huge continent, shipment periods can be very long. With NaviTab, companies are relieved of the burden of ensuring they are not breaking the ever-changing regulations between and within countries,” concludes Marshall. What is holding back digitalisation on the bridge? Vast numbers of vessel navigators are not using digital navigation and route optimisation to their fullest because of the challenges of implementing and using the technology. Shore-based management is investing in advanced voyage planning and weather routeing services, but many bridge teams are not following these optimised passages. How Will Ship Routing Look in Fifteen Years? Thought Leader and VP of Shipping Products, Mike O'Brien, looks into the future of the shipping industry to discuss how advancing technologies such as increased digital connection, autonomous shipping and vessel motion sensors will alter the way we route ships. Estimates for the number of containers lost vary from a couple of hundred each year, all the way to 10,000. However, the most recent and widely accepted report is from the World Shipping Council, which in 2014, polled its member companies. These companies make up 90% of the world’s containership capacity. The integration of DNV GL’s ECO Insight and Navigator Insight solutions with StormGeo’s FleetDSS and ship reporting solutions will ultimately result in a product that provides complete fleet performance. This includes route advisory, navigation and planning, and fleet performance management services. © 2019 - StormGeo. All rights reserved.